Day 4 no voice! But on the up side my Korean classes are going well. ^^ Did everyone have a good Monday? Just thought I would do a little update for no real reason. 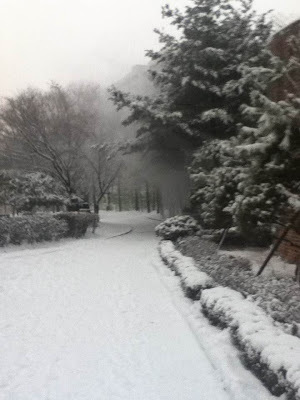 It's snowing here in Seoul and I guess that means it's still winter. We had a few warm days this past week and it reminded me of what spring is like in Korea. I hope spring in Seattle is just as lovely. This weekend I was busy doing some scrubbing around the place for the new person. It's amazing how much soot can gather on the veranda here. This person has been in contact with me, which has been really great. I'm able to sell off some furniture to her and know what to leave behind. But most of my stuff has been spoken for and will be purchased and picked up closer to my move date. I've pretty much got it down what I need to do to get Tom out of Korea. I'll be heading back to the Vet about a week before we fly to get his final documents in order. I've got his carrier all ready to go, although I'm not sure whether to add a frozen cup of water for him in there. Even though I will be leaving Korea my ambition to blog about my life isn't going to stop. It was mulling around my head for a while and I finally got down to it. I have created a blog for my new life back in America. It's called, "American-Joy" and you can click the name for the link. Like this blog I intend to fill you in on my adventures and thoughts. Also I hope to pepper things with posts about being a graduate student and learning in the field of TESOL. So head on over there and become a "follower" or whatever you need to do to keep up with my posts. I'll still post on this blog until I leave. Thanks so much to all my readers and hope you enjoy the new blog! It's a freezing start to January and still lots of winter weeks ahead before things could potentially warm up. But I seem to be doing well staying warm this winter with my fantastic Marmot down coat I bought a few years ago. It helps to have a reliable coat, hat, scarf, boots and mittens to last through this season. I can't help but say I'm looking forward to the endless rain in Seattle, because at least it doesn't get too cold there! January is going to be a month with Winter Camp, a week off and then back to regular work. I'm looking forward to camp, that starts next week. For one I miss the kiddos and also it's my last camp. I have the high levels this time with a few spunky kids in it that are really fun to be around. So I can't wait to get all goofy and giggly with these kids. I know that teaching and being in the classroom is going to be what I will miss the most when I leave. After five years here, stuff starts to accumulate. I'm talking about books, souvenirs, memorabilia, and just anything else I've held onto over the years. So I've been sorting things lately and making one big pile of "donate" and the rest is being packed into boxes to be shipped across the ocean. I found it the cheapest to send via "surface" or by ship. But the weight limit for each box is 20kg or 44lbs. So trying to meet these requirements is a little tough. If I go, Tom goes! I'm taking my fur ball with me to America and this will be my first time flying with a pet. Actually, I have a sad story about flying a pet in my past but I don't want to share it. Ha!